Babs winning the World Veteran Winner-title at the World Dog Show in Denmark 2010. I live in Nannestad, about 40 km north of Oslo in a small house close to the woods with my two dogs. They live inside the house, sleep in the coach and sleep in my bed. I work as an environmental officer in the Public Roads Departement Eastern Region witch is a super job suitable for my education. I spent 5 years in the Agricultural University of Norway, and was Cand. agric in 1992. Autumn 2001 I got a quite terrible message: I have got Multiple Sclerosis. I am managing very well for now, and hopefully I won’t get too bothered… but the future is very unsure.. Despite this illness I am very active with my dogs, and I work full time. I have always been fond of animals, and I had lots of them when I was a little girl… In addition to the dogs you can read about under «memories» I had some other animals too…. My first was a hamster – I had 3 of the kind. Then I got the gerbil Bulle, I had a small parrot called Ludvig, a small bird called Anthon, I had a rat with the name Rudolf – and not to forget the wild crow Ben Hur ! Once I also caught a squirrel who lived in the house with us for a couple of months… Some days after I had let him out in the open, he was found in our neighbour’s kitchen, stealing a banana ! I also had a female rat, Stine, who I found pregnant only some days after I got her. 3 weeks later she got 11 small, pink kids !!! When I was studying, I really missed having a dog around. My bedlington was growing old, and lived with my parents, and I really wanted a dog of my own. For several years I was very fond of riesenschnauzers, and I desided to get one. But before I realized my dream, my friend Ingrid asked me if I had looked at the briard sometimes… No, I didn’t really know much about them, but when I started to read about them, I just knew that THIS was the dog for me. Big, heary, and suitable for lots of activities. I got in touche with the breeder Torild Borg, and she had the little fawn girl I wanted. In spring 1991 Sara (Torilsin Cara) moved in with me, and changed my life. I entered her in lots of dogshows, always optimistic, hoping for good results. Most of the times I was disappointed… either she didn’t like the judge, or she behaved like a maniac towards the other dogs… But finally, at 4,5 years, she got her championship ! During those years I also entered her in some obedience competitions, and she got her 1st prize in the lowest class. I entered her only once in the 2nd class, with no success – she got e 3rd prize :-). The summer 1993 she and I was on our first workingdog camp at Sølen… I guess I don’t have to tell that it was no success…. Sara was not very eager to work, and I didn’t train anymore in the woods with her. The same summer I visited my breeder Torild, and she had a really nice, deep fawn puppy at house… he was 6 months old – and charmed me to death ! I felt I had to take him home with me ! And so I did… Rudolf (Torilsin Gale Grieg) developed into a really good working dog (we went to Sølen the summer 1994 and he did really well), but unfortunately he didn’t really handle the life outside the woods… He attacked all dogs (but was nice towards puppies), and ha was very ugly towards people… I entered him in some obedience competitions, with quite nice results, but I didn’t dare having him with the behaviour he had towards people, so he was put to sleep at the age of 3 years. That summer (1995) I got to know both K-Agir Alland and K-Arja – two puppies after the combination from Picador Uncle Nickie and (Torilsin) Arja. I really liked both of them, both their looks and the mentality, and decided that if Torild made that combination once more, I would have a black female puppy. She mated Arja with Nickie once more, and the summer 1996 Lotta (Torilsin Lois Lane) was born ! She was born while I sat in my car, driving home from a short holiday in Trøndelag. Torild rang me and told me in the same moment she was born: NOW SHE IS HERE ! With Lotta a new life with briards began ! 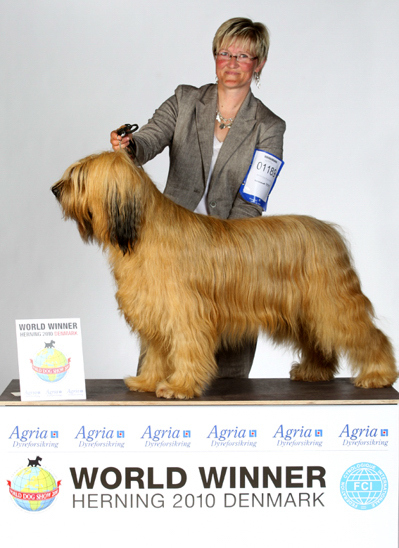 Lotta did really well in dogshows, beating most briards with her effortless movements. Lotta was a very good working briard in my opinion, never giving up, and with full intensity. Unfortunatey I was fed up with competitions by the time I got her, so she wasn’t entered in the obedience ring before she was 6 years old ! But when we did, she did splendid, and got a 1st prize in her first competition. I also used 5 weeks of training to get her ready for NKK’s workingdog test – which she also did very well, and came as 3rd best dog that day ! She was 4 times BOS at the Briardclub’s special show, and BOB in a special show in Sweden. In addition to that she got several CACIBs in both Norway, Sweden and Denmark. I bred the first litter in 2000 with Lotta (INT N DK UCH NV01 Torilsin Lois Lane) as a mother. She was bred to the young hunk LP Cartier Monzerat Nemo (who got the titles LPI LPII KORAD (+ 234) INT NORD DK UCH SV02 NORDV03 during the years after). From that litter I kept Babs (LP2 INT NORD UCH EST CH KBHV04 NV07 WVW10 EUVW11 NVV11 Mezzoforte Surprise). Babs is the cutest and kindest briard I have had, calm and nice, never «taking off». She followed her mother and fathers footsteps, and has done very well in dogshows too. She was also trained for both obedience and working competitions, and did quite well when I at last found the right way of training for her. She was’n the best dog for competing, but she gained the title LP2 from Sweden (3x first prize in second grade), and she qualified for grade B in tracking. I even entered her in one competition in B-tracking, but we failed on the track… Then I realized that her career as a working dog was over. Then I got Willy – and about him you can read under his own page :).